1. Can you tell my readers a little bit about your book “God Needs No Passport”? God Needs No Passport is the story of how new immigrants are changing the American religious landscape and making it just as global as our economy and politics. It’s based on conversations with people from Brazil, Ireland, India, and Pakistan who live in the Boston area and with their friends and family members back home. Our debates about immigration in this country are out-of-sync with how people actually live their everyday lives in three ways. First, when we think about immigration, most Americans expect people to trade in their membership cards in the countries that they come from for a membership card in the United States. The reality is that more and more people continue to invest, build homes, and vote in their homelands at the same time that they start businesses, establish religious congregations, and join the P.T.A. right here. This is a good thing for our country because they are the bridge builders, translators, and religious diplomats we so desperately need. Second, when we think about religion, most people assume we mean Judeo-Christianity. The type of religious beliefs and practices that many newcomers import do not fall neatly into the model of “bibles, buildings, and boys” or the assumption that religious life takes place in a formal building, where there is a book we all believe in, that a male leader teaches us about. For many of the people I spoke with, there was a great deal of overlap between religion and culture. Faith spilled over into their living rooms, the schoolyard, and the workplace. What they do outside the walls of official religious buildings is much more important than what they do inside them. If we are concerned about deepening and strengthening religious pluralism in this country, we need to learn to think outside the Christian box. Finally, just as we learn to think outside the Christian box, so we need to think outside the nation-state box. Grasping that people earn their livings, participate in elections campaigns, or raise children across borders is challenging because many of us take for granted that the world has been and always will be organized into sovereign nation-states. But such a view is short on history. Capitalism, imperial and colonial regimes, anti-slavery and workers’ rights campaigns, illegal pirating networks, and, of course, religions have always crossed borders. Assuming that social life automatically takes place within a national container blinds us to the way the world actually works. Assuming that political outcomes are decided nationally doesn’t give enough credit to political and social movements involving activists around the world. Taking literally the label, “Made in the U.S.A.” ignores the fact that some piece of that garment was probably made in Latin America or Asia. Eberhard Sandschneider, the Research Director at the German Council on Foreign Relations in Berlin got it right when he told the 2005 Davos delegates that what we are increasingly seeing is a multidimensional system in which states work with businesses and civil society through a dense web of international and interdisciplinary networks. Bush administration officials, who told the members of the 9-11 Independent Commission that what happened was completely beyond their imagination because they could not envision a terrorist operation organized across borders, nor did they have the capacity to respond to one, got it dangerously wrong. So many of the problems we face are transnational problems that need transnational solutions. 2. Why did you decide to research the connections between immigration and religion? I have been studying immigration for close to 20 years. My first book, The Transnational Villagers, was about people from a small village in the Dominican Republic who settled in one particular neighborhood in Boston. I was fascinated by how the people who moved and the people who stayed behind continued to occupy the same social space, and save money, raise children, and worship together, even though they were separated by physical distance. The Catholic church played a big role in helping them do that. Much research on immigration has left out religion and I thought it was time to change that. 3. How do discuss with a stranger sensitive topics such as religion and patriotism? I felt incredibly fortunate to share people’s “religious biographies.” Most people I spoke to were extremely generous and open. They want people to understand what they believe in and thought I might help them get their stories out. 4. In your opinion, is religion a threat to America? Is religion dangerous? Despite predictions of secularization, religion is clearly here to stay. Are there people out there who hold extreme values and want to convince the rest of us of their truth? Of course. But that is religion at the margins. The vast majority of people fall in the religious middle. They care about family and community. They care about good jobs, housing, and the environment. They fall along all sides of the political spectrum and, therefore, represent potential partners on all kinds of issues. The religious right has controlled the political use of religion for too long and its time for the left to reclaim religion and use it to promote progressive causes. 5. What was one of the most surprising things you discovered in your research? One big surprise was how much people’s transnational connections change over the generations. Let’s take the case of Irish immigrants. The new Irish leave behind the “Celtic Tiger” — a country that is richer and more powerful than ever before. The parents of second and third generation Irish Americans left behind a country that was desperately poor. While these Irish Americans still think of Ireland as the place of leprechauns, green beer, and thatched roof cottages, their contemporary counterparts think of computers and condos. When these newcomers and old-timers meet, an interesting generational clash results. 6. Can you tell my readers about the Transnational Studies Initiative? TSI is an attempt to get people who are concerned about all kinds of economic, social, and political cross border processes to talk to one another. I work on transnational migration and religion. My co-founder researches transnational social movements and politics. We knew there were many researchers and practitioners doing this work around the world but they did not see themselves as part of the same conversation. Nor had they really rethought things like citizenship, belonging, or identity in response to this shared conversation. TSI organizes these encounters. We’ve also published The Transnational Studies Reader to share our perspective with students and practitioners and to specify how it differs from other ways of thinking about global processes. 7. How can the global community benefit from all of this? I’ve been amazed at the level of nationalism driving much of the 2008 presidential campaign. A case in point is all the “America First” signs that we saw at the Republican convention. Many Americans are fearful of people who hold multiple loyalties. They say that dual citizenship is like polygamy – it’s impossible to be loyal to two countries at the same time. But this is in our future. And it is entirely possible to be an active, contributing member of two places simultaneously. Immigrants are miles ahead of the rest of us because they have let go of false dichotomies like either/or, in or out and show the rest of us how to live in a global world. We should celebrate and emulate their example rather than thwart it. 8. What’s next for you and your work? I’m turning to arts and culture. I’m interested in how national artistic and cultural institutions, which were created, in part, to create national publics, change when national life no longer obeys national boundaries. I’m curious about how much these institutions recognize these demographic changes and how they respond to them. I’d like to explore this by looking at museums, media outlets, and American universities that are setting up campuses abroad. 9. With your experiences traveling for your research, what’s the best advice you can offer the international traveler? Be humble and respectful. Listen much more than you speak because there is so much to learn. I’d like to know more about who your readers are. Thanks for this opportunity to share my work with you. I cannot accurately answer that excellent question. Thanks to the wondrous anonymity of the Internet, I’m not sure who reads The Magical Buffet. I would like to think cool people like Stephen Colbert and Joss Whedon check my website daily for information and entertainment, but despite my best rum fueled fantasies; I doubt that’s the case. What I do know is that anyone who reads my site regularly and enjoys it is someone who would probably like me. The Magical Buffet now more than ever, thanks to the relaunch we did in July, is a pretty accurate reflection of who I am, despite that fact, we keep gaining more readers. It’s nice to feel liked. 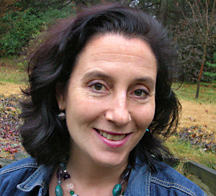 Peggy Levitt is Associate Professor of Sociology at Wellesley College and a Research Fellow at The Weatherhead Center for International Affairs and The Hauser Center for Nonprofit Organizations at Harvard University where she co-directs The Transnational Studies Initiative. 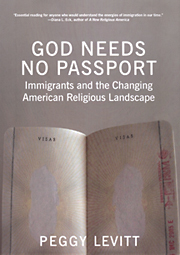 Her book, God Needs No Passport: Immigrants and the Changing American Religious Landscape was published by The New Press in July 2007. The Transnational Studies Reader was also published by Routledge Press in 2007. Her first book, The Transnational Villagers, was published by the University of California Press in 2001.